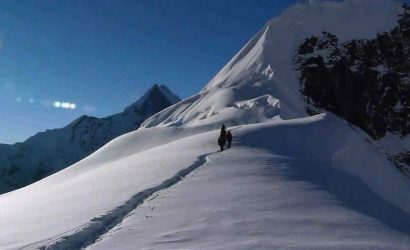 The Great Adventure Treks & Expeditions (P) Ltd offers an exclusive adventure to Himalayan high peaks of Island Peak or Imja Tse at 6,189m./ 20,305ft. Situated at the top of the Imja Khola valley in the Khumbu area, just above the summer settlement of Chhukung, surrounded by the Imja, Lhotse and Lhotse Shar glaciers, adventure begins with a short sweeping scenic flight to Lukla the gateway to Everest, trek starts from here, the route follows several farm villages offering awe-some views of the high snow capped peaks, leading to the highest alpine valley and to Kalapatthar view points at 5,545 m and Everest Base Camp offering the best of Khumbu before the climb of Island peak with outstanding panoramic views of unparallel peaks and glacier including Mt. Everest at mere 5 k.m. distance for the top of Island Peak. 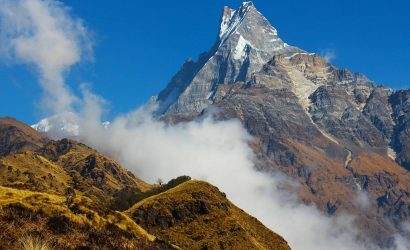 The Great Adventure Treks & Expeditions (P) Ltd trek and climb of Island Peak or Imaja-tse offers grand sceneries and beauty of the surrounding landscapes, which combines all the highlights of the Everest National Park including Namche Bazaar, Khumbu’s Sherpa capital, glamorous view point of Chkung ri and walking to the final destination at Island Peak base camp with a thrilling steady climb with the support of GA high quality mountain guides from the summit with amazing views of Nuptse, Everest and Mt. Lhotse at 8,516 m / 27,940 ft worlds 4th highest mountain. So this is an adventure within greatest mountains, after this remarkable journey trek leads back to Lukla for the scenic short flight back to Kathmandu. It offers a worthwhile challenge to the experienced winter mountaineer, competent in using ice axe and crampons, being technically straight forward, the most difficult section being a mixed rock and ice wall at a slope of around 45 degrees leading to the narrow summit ridge, approximately Scottish Winter Grade 2. 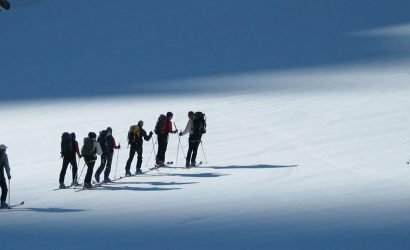 The climb will be undertaken towards the end of the trek when everyone will be fully fit and well acclimatized. Day 01: Arrive in Kathmandu 1,300m. and transfer to Hotel. Day 03: Fly o Lukla 2,800m. & 3 hrs trek to Phakding 2,652m. Day 04: Trek to Namche Bazaar 3,440m. 5 - 6 hrs. Day 05: Rest Day at Namche Bazaar for acclimatization . Day 09: Trek to Gorakshep 5,140m. / Everest Base Camp 5,360m. Day 10: Trek to Kalalpathar 5,545m. and continue to Dingboche. Day 11: Trek to Chhukhung 4,730m. 3 - 4 hrs. Day 13: At Base Camp Rest day. Day 14: Trek & Climb to High Camp. 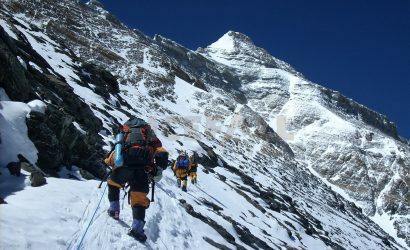 5,400m. 2 - 3 hrs climb. Day 15: Climb to the Summit. Day 16: Trek back to Dingboche. 5 - 6 hrs. Day 17: Trek to Thyangboche. 4 - 5 hrs. Day 18: Trek to Namche Bazaar. 4 - 5 hrs. Day 19: Trek back to Lukla. 6 - 7 hrs. On arrival at Tribhuvan International Airport meet our staff with GA complimentary transport transfer to relevant Hotels, our guide will give you information of the Hotel, Kathmandu, Trekking, and related information that you might require while in Nepal with GA. In Kathmandu, half day guided sightseeing tour in Kathmandu at places of interest, as Kathmandu valley is rich in World’s Heritage Sites. Approx: 30 minutes flight to Lukla 2,800m with 3 hrs walk to Phakding at 2,652m. An early morning start with a drive to domestic airport board as per the flight time board in the smaller twin otter or similar plane for the sweeping panoramic flight to Lukla, our trekking guides will receive you. The walk from here is gradual most of the way, with few ups offering views of Kusum-Kangru 6,369m after 2-3 hrs of good walk reaching at Phakding for the overnight stop in one of the best available lodge, Phakding village situated by the bank of the Dudh-Kosi River. Day 04: Trek to Namche Bazaar 3,440m approx. 5 - 6 hrs. After Phakding crossing the suspension bridge over the Dudh-Kosi the walk is pleasant with few short uphill and downhill and re-crossing the same river again, with magnificent view of Thermasarkhu 6,608m, then reaching a small village of Monjo after the last 20 minutes climb from the stream, after Monjo, comes to the entrance of Sagarmatha National Park, from here a short descend with a gradual walk to the Jorsalle village is reached, the trek continues to the last bridge over the Imjatse river, from here the walk is along the winding uphill path all the way to Namche Bazaar, with magnificent view of Kwangde peak, Kusum kangru Mt.Everest- Nuptse wall, Lhotse and the closer view of Taweche peak can be seen all the way up, from here 1hour walk up to the Sherpa’s capital at Namche Bazaar, the houses and lodges are placed in an amphitheatre shape. Necessary rest day for acclimatisation optional activities a short hike uphill to the Sagarmatha National Park Headquarter, a magnificent spot perched on top of Namche Bazaar with grand views of snow capped peaks and valleys, visit the museum with all types of information regarding the Himalayas, geographic, culture, mountaineering history and existing information on flora and fauna of this region, afternoon free at leisure. Trek uphill for 20 minutes to the top ridge of Namche Bazaar, once at the top walk follows on the gradual winding path with few short up and downs overlooking magnificent view of the great giant snow peaks from Everest, Nuptse, Lhotse, Ama Dablam, Thermasharkhu and Kwangde-ri after a good trek descending to Phungitenga 3,250m, a small settlement in the middle of alpine forest of silver firs, blue pines, rhododendron with few magnolia and birch trees. A climb of two hours after lunch on the winding up-hill path through the serene woods till Thyangboche Gomba (Monastery) is reached for the night stop. An amazing spot offering views of the majestic towering Mt. Ama Dablam with Mt. Everest above Nuptse wall to the North, Mt. Lhotse and Lhotse Shar on the north east. Visit the monastery and observe the monk prayer an absolute perfect harmony blending well with the peaceful surrounding. Morning descend woods, cross the Imjatse Khola and climb steadily to the village of Pangboche. This is directly opposite of Ama Dablam at 6,856 m., from here Pheriche is a good walk of three hour’s situated beneath the impressive peaks of Cholatse 6,440 m. and Taweche 6,542 m.
Trek up the wide valley beneath the impressive peaks of Cholatse and Taweche on the left, then a climb towards the foot of Khumbu Glacier at Dughla a good spot to have lunch, before the steep up, the top Thugla pass has numerous stone cairns-memorable of unfortunate climber’s natives and of foreigners who have died while climbing on Mount Everest and other high peaks of this area. The path continues on the left side of the glacier, to eventually reach the cluster of houses at Lobuche for the overnight stop. Day 09: Trek to Gorakshep 5,140m. / and continue towards Everest BC 5,360m. Walking along the side of the Khumbu Glacier which is straight forward at first, but later the path becomes rocky and awkward, climbing across the moraine. The peak of Pumori at 7,145 m. lies ahead and to the right, on the opposite side of the glacier, Nuptse rises high, the last moment to Gorak Shep with a small cluster of lodges. Directly above Gorakshep is Kala Pattar 5,545m walk continues towards Everest Base Camp and to the Khumbu Ice-fall, the path from here can be misleading, follow the lead Sherpa, every year the trail changes due to the movements of the glacier, the walk is quite strenuous due to the high altitude and thin air, the walk passes through over rocky dunes and moraine and streams, till it reaches at base camp. 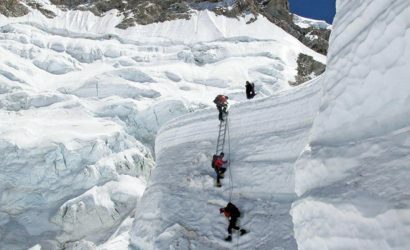 Everest Base Camp is lively during the high expedition season. Return back to Gorakshep for the overnight stop. Day 10: Hike to Kalapathar and trek to Dingboche 4,360m. 4 - 5 hrs. Morning hike of two hours to Kalapatthar, on reaching the top enjoy the panorama views of the surrounding snow peaks and the closest view of Mt.Everest, from here return to Gorakshep for the walk towards Dingboche. Journey back to Thugla, after Thugla a nice walk leads to Dingboche in the Imja-tse valley with great views of the surrounding snow capped peaks, including the classic view of Island peak. Today, an easy walk for 3 hours climbing up gradually to a small settlement of Chhukhung for the night stop, afternoon is spent relaxing and necessary preparations or for an optional hike around, for great scenery of the surrounding high peaks and glacier. Day 12: Trek to Island Peak Base Camp 4,970m. 3 - 4 hrs. 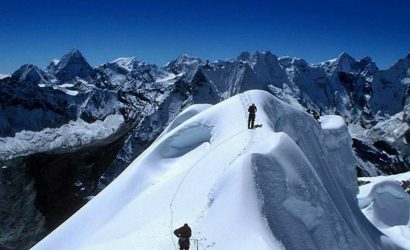 A rest day to acclimatize and for preparations the climb of Island peak. Day 14: Trek & Climb to High Camp 5,400m. 2 - 3 hrs climb. Day 15: Climb to the Summit at 6,189m. Day 16: Trek back to Dingboche 5 - 6 hrs. Descend to Pareshya Ghyab, continue further along (4,343 m.) the easy trail to Chukung. After lunch we will walk for about 3 hours finally reaching to a village of Dingboche and camp for the night. Day 17: Trek to Thyangboche approx. 5 hrs. From Pheriche a short walk brings you to the bridge, after the bridge it is nearly downhill all the way with few ups in between Pangboche and Thyangboche, on reaching the bridge back to the tree-lines and green vegetation, an hour up to Thyangboche for the overnight stop. Day 18: Trek to Monjo. 2,835m. Approx: 5 - 6 hrs. Retrace the journey back to Namche Bazaar on the downhill and gradual path. After Namche Bazaar down hill walk most of the way to Monjo for the overnight, Monjo village located near Sagarmatha National Park Entrance. Day 19: Trek to Lukla 5 hrs walk. Today the end of this great adventure trekking back to Lukla, a leisure and pleasant walk, with few short up-hills to encounter, on reaching at Lukla, last dinner with the fellow Sherpa guides and porters. Day 20: Fly Lukla - Kathmandu. As per the flight time, (sometime the flight delays due to bad weather and other technical reason). Check in for the scenic flight to Kathmandu with panoramic views of high mountains during 30 minutes flight. On arrival at domestic terminal, GA staffs transfer you back to the Hotel. Day 21: Free day in Kathmandu at leisure. Today as per your international flight time, keep your confirmed air ticket, Great Adventure Trek staff will transfer you to international airport for your final departure from Nepal, the land of high Himalayas.